The "Abraham Darby" (a David Austen rose) has bloomed for the first time this year. I'm always intrigued by its ruffly petals that remind me of an old painting. So I tried my hand at making the photograph look more like a painting in Photoshop by using a texture, erasing the texture strategically, and then adding in highlights sparingly. You sure did a great job on the picture. Gorgeous rose. Happy Easter to you and your family. Gorgeous photo! It's so hard to decide which is my favorite rose but since I have always made sure to have an Abraham Darby in every house we have lived in for the last 15 years (except in Colorado--I wasn't there long enough) I would have to guess that AD is at least in my top five. Mine is doing very well--I have had three huge lucious blooms already and there are 6 about to bloom and tons and tons of buds. It takes a while for an AD to really establish itself and mine looks like it has (finally) reached that point this year. Yay! Really beautiful! I'm glad you are realizing how much creativity and talent you have! Just beautiful! Love this digital painting. You truly have a knack! Cindy, the flower looks like a beautiful Southern belle dress! It's probably the prettiest flower I've ever seen. Great job! Wow, that is a beautiful rose. The petals look like fabric all folded up. That's one of my favorite roses too. The digi painting looks great. Lovely rose Cindy and you made a lovely "painting" of it. 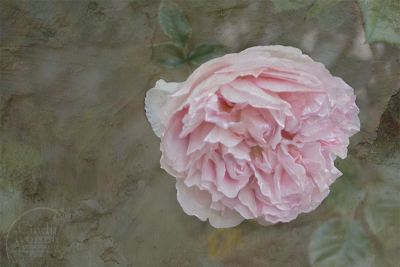 I've just bought a new David Austen rose myself: Constance Spry, a pink climer. Can't wait for her to flower. I came over from Muddy Boot Dreams. She paid a nice tribute to you today. Love "Dusting in Pearls" -- congratulations! This rose is gorgeous and the texture is beautiful! Very pretty rose and the way you altered the photo makes it look quite unique. Jen at Muddy Boot Dreams sent me... and I'm so glad she did! That rose is simply breathtaking and I can't wait to browse through more of your blog and find more gorgeous treasures like this one! Beautiful photo, gorgeous rose and great Photoshop effect. You are something!